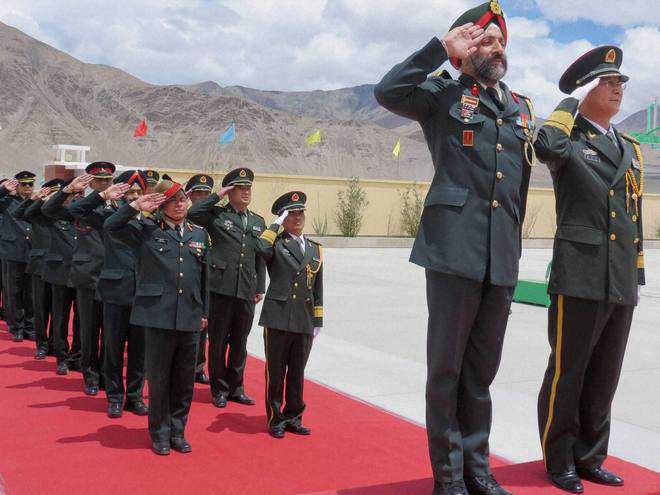 (TibetanReview.net, Oct02, 2017) – India and China were not holding their annual border personnel meeting (BPM) on Oct 1 to mark China’s National Day because China did not send the invitation as per past practice, reported tribuneindia.com Oct 1. The event takes place on China’s national day and is a socializing occasion as well. There has also been no forward movement on the 7th edition of the annual “Hand-in-Hand” exercise between the two sides, reported timesofindia.com Oct 1. These are partly attributed to the holding of 19th National Congress of the Communist Party of China beginning Oct 18, although some see it as a fallout from the Doklam standoff between the two sides over Jun-Aug 2017. The reports said the annual ceremonial meeting was to be hosted by China and used to be conducted at the five designated BPM points across the breadth of the 4,057 km-long Line of Actual Control (LAC) — the de facto boundary between the two countries along the Himalayan ridgeline. The reports said the meetings could not be held because the People’s Liberation Army did not send the invite for the ceremonial meeting as has been the norm every year, sources on the Indian side were cited as saying. The tribuneindia.com report noted that at the last such scheduled ceremonial BPM on Aug 15 — at the peak of a stand-off between the two countries at Bhutan’s Doklam — troops on both sides exchanged sweets. That occasion marked India’s Independence Day. Beijing’s current failure to invite comes just four weeks after the two neighbours ended the 73-day military stand-off and will be keenly analysed in South Block — the seat of power in New Delhi, the report said. The report said the ceremonial BPM delegations are led by Brigadier-level officers from the two sides. Such meetings are different from flag-meetings conducted to lodge protests of transgressions. Ceremonial meetings are, on the other hand, events for armed troops of either side to know each other socially. Normally, there is a lunch hosted and a cultural show. Mostly, the spouses and children of top officers also join in, the report added. The report said there were five such meeting points along the LAC and ceremonial meetings were hosted at all these points: Depsang in sub-sector north and Sappangur Gap (both on eastern Ladakh), Nathu La in Sikkim and Bumla and Kibithoo in Arunachal Pradesh. On the other hand, the two armies were reported to continue to maintain their stepped-up force levels near the Sikkim-Bhutan-Tibet tri-junction, just weeks after the troops disengaged from the stand-off site at Doklam, concluding 73 days of tense confrontation, the report said. China’s show of hostile and hardline posture is partly attributed to the holding of the 19th National Congress of the Communist Party of China beginning Oct 18. But some interpret it as China’s reaction to the standoff between the two countries over Jun-Aug 2017 when China’s official media repeatedly threatened war to expel the Indian troops from Doklam, a piece of border territory in Bhutan claimed by China whose occupation of it is seen as a serious threat to India. There are seven to eight occasions in a year that the two armies hold the ceremonial meetings at the different BPM points, which include speeches, cultural performances, exchange of gifts and tea, as a confidence-building measure, said the timesofindia.com report.